The ‘level of resource required’ would presumably have involved proper terms and conditions for their staff. 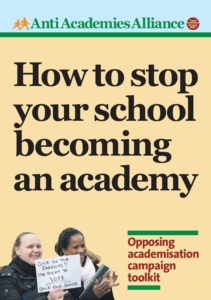 Last year STEM in Islington had to back down when teachers there held a victorious campaign for union recognition and against zero-hour contracts. Apparently the plans to open the South Norwood STEM free school in Croydon had provoked concern from the Harris Federation. The chain operates nine academies in the borough. Croydon is also home to its headquarters where chief executive Sir Dan Moynihan earned in excess of £375k last year. St Adhelm’s Academy in Poole was closed for three days last week when parents were told there were insufficient staff to guarantee their children’s health and safety. This is the latest in a string of disasters to hit the Dorset secondary. Its sponsors have said they want to leave the school, after receiving an inadequate Ofsted judgement and a financial notice to improve, when managers fell for a million pound email fraud. 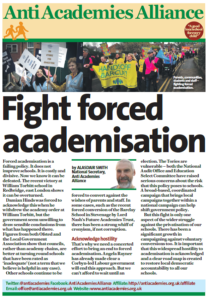 The Bournemouth Echo recounts a catalogue of problems which the current joint sponsors, the Diocese of Salisbury and the University of Bournemouth, have failed to tackle. 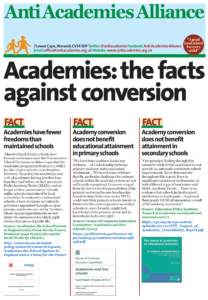 Sir David Carter, the Regional Schools Commissioner – the DfE’s viceroy in the South West – is now in talks with the Ambitions Trust to take over the academy. We note that the Ambitions chain may well be ambitious but it has no experience of running a mainstream secondary school. Teaching and support staff face an uncertain future at Helenswood and William Parker Academies in Hastings, East Sussex with 64 jobs under threat because of funding worries. The academies are part of the Ark Group, whose chair Tory donor Lord Fink, has been in the news this week regarding his banking arrangements. We’d like to say a big thank you to everyone involved in organising and all who attended our highly successful AAA SERTUC conference last weekend. Please read our full conference report here.